Do any of you guys skate slalom on quads, and if so what type of quads are you guys on? Noticed that grapevine-type moves are hindered by toe stops. Also high boot is a must. But wheels are a concern, it seems that some are flat and some are rounded on the outer edge. I'd probably be doing this outside and inside. Any advice appreciated. I'll also try the other forum sections for advice. Well on quads you either have full wheelbase or 0. So to slalom on quads is a lot harder than inlines. You can't get the angle needed for the cuts. You'd need a ridiculously short wheelbase and DA45 to make the cuts an inline can with simple rockered set ups. I can do a lot of stuff on quads and inlines, mostly the same things from one to the other, but even the 80mm wheels no rocker and a 273 frame make my quads a joke in comparison. I use a size 10 vanilla freestyle boot, which is low cut. And a size 12 Arius plate. Great turning plate but wont cut like a inline. A higher cut boot wouldn't do quads much good, you need ankle articulation and just the way they work... I don't think it would pan out well. Could be wrong though. If you can hold the edge of a wheel better with the high cuff. Theres a video around here or on YouTube of someone freestylin on quads outdoors. Doing a good job at all sorts of stuff. Does a few cone tricks too. If I remember this right he's on the edges of his wheels and uses a above ankle boot. Toe stops? Who needs those? Use jam plugs! I am exclusively a quad skater (hence my name). I started skating 4 and a bit years ago, and I have never tried inlines. I don't do slalom, but I do quite a few slalom moves on my quads (mostly off the cones, but sometimes on the cones). I took the stoppers off my skates the first day I started skating. I don't use jam plugs either (they're just a nuisance and get in the way). Even without anything at all in the toe stop holder, I was still catching the toe block of the baseplate on the ground during certain moves, so I ended up getting NTS plates. I still sometimes use my plates with a stopper holder, but I had to grind down the toe stop boss (semi-nose job) to make them usable. My boots are hard shell hockey style boots that are very common in the UK. I can't say that they're particularly good for slalom, but they do suit my style of skating, and I've managed to do a good number of slalom moves on them (some of which even my inline skater friends cannot do). Apparently there are a lot of quad slalomers in France and they trend to use quite stiff and less turny actions, which seems completely counter-intuitive to me, but they swear by it. My instinct would have been to go for soft cushions and as much response and turn as you can get, because the biggest problem that I encounter is being able to turn anywhere near as tightly as an inline skate. Getting through 80s is bad enough, but on 50s it can be a real struggle. Of course you need ensure that stability is not compromised otherwise other moves start to suffer (wheeling etc.). I suppose a lot depends on what kinds of moves you most want to do. I did consider going for a shorter wheelbase plate in order to get a tighter turning circle, but doing so would mess up my ability to do my favourite slalom moves; I need the toe clearance and maximum forward tilt (particularly for the move I'm working on at the moment) which short plates don't allow. I do slalom quad skating with all wheels down on as sharply turning of a plate set up as I can get (DA45 with super squishy upper barrel cushions and a reversed cone lower hard cushion -see pic below), but even this setup is still not able to handle short cone spacing without getting up on just the front two wheels. This is one reason French slalom skaters dis the the soft suspension setup, since it gets too squirrelly as the rear of the plate comes further up off the ground and only the front two carry the load. In my own way I sort of arrived at a similar conclusion. I soon realised that certain skate properties were mutually exclusive; so I either had to use a compromise that was not effective in either aspect, or forego certain qualities and pretty much give up the tricks that went with them. I decided on the latter, and opted for stability at the expense of 'turnability' (due to the kinds of moves that I most wanted to do). I did find some work-arounds though. By using very pronounced unweighting, I'm able to do moves like Crazy or Mabrouk with all wheels down (during the entire move) even on super grippy 78a wheels. I use a similar unweighting technique for my Fan Voltes too. Also, I will often tilt over and balance on my wheel edges (when doing tricks like 1-cone crazy etc.). What kind of slalom moves do you already do? and what (if anything) are you currently learning? I really did not continue with slalom to the stage of doing moves. Just steadily working for about 10 sessions at getting through the normal spacing of cones was as long as I did quad slalom. Never could improve enough, and all other skaters in the group were inliners, so I had to have my own further spaced cone line, making me feel like I was an odd man out. May revisit the group as soon as weather warms up, and see how my latest & turniest build may help. Oh, you learned as part of a group? I think I would find that quite demoralising (if they were all inliners) because I'd feel at such a disadvantage. I just practised on my own and taught myself, and I found that I made pretty good progress. 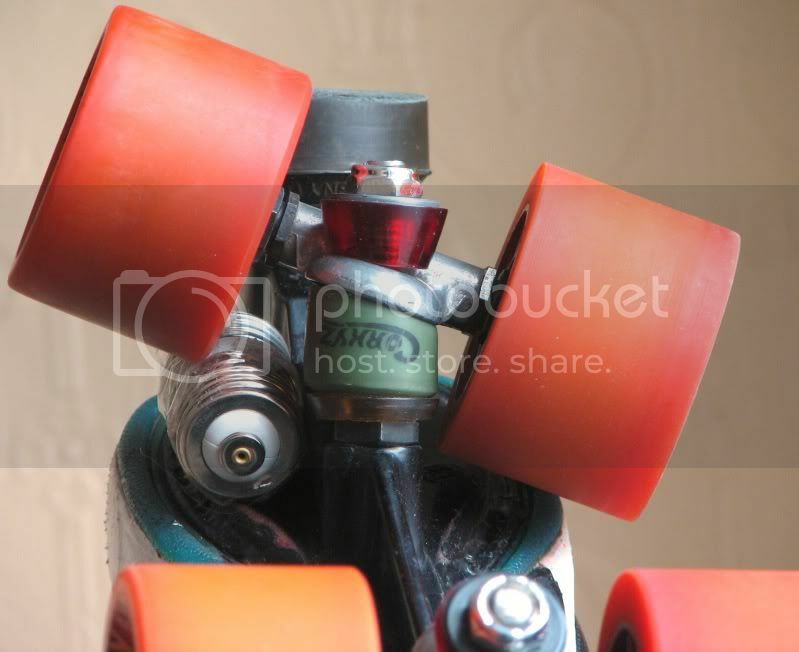 Looking at your avatar photo, I could do with that kind of front wheel clearance on my skates. It would be ideal for the kind of slalom moves that I do! I've rarely seen quads that are capable of rolling with the sole of the boot vertical (which your skates look like they could do). However, there is always a compromise. Having my front axle that far forward would mean lengthening my wheelbase, which presents its own problems. That is one area where I did go for the 'compromise option'; I ended up moving my plate just a little forward (coupled with using slightly larger diameter wheels). It was a step in the right direction but I still regularly snag the toe of my boot on the ground during more extreme moves. I therefore have to reduce the tilt angle to compensate, although that does make doing certain moves significantly more difficult. The avatar build is actually my training build for outdoor speed. The far forward front axle is the Aussie style build, and they usually bring the rear axle up forward quite a bit as well -- more than mine is anyway. Harder to get up on toes when front axle is this far forward - takes a lot more force from ankle to get the toe extension. Great for rolling over surface imperfections and debris though, especially with the 76mm Z-Hawg wheels. Thanks guys. Great info, super psyched for some quads. But...just about the same time I asked about quads I really fell in love with ice skating, so now the money I have for the quads is going to go to a pair of ice skates. I can't wait to get my quads too. LIFE IS GOOD. There are not enough hours in the day. Also, (side-note), the place where I set up cones became unfrozen this past week!!!!!!!!! I'm having trouble understanding what you mean by this comment. Are you maybe talking about Toe Grapevine moves? because I cannot see how toe stoppers could have any effect on a standard Mabrouk (or a standard Crazy for that matter). Huh, I'm not sure what I was talking about. Maybe I was talking about toe toe grapevine. I do that a lot on inlines. I can do grapevine on figure skates and that has an even more pronounced toe type hinderance. So I'm actually not sure. I'll tell you the next time I borrow a pair. My bad. Seeing as you're someone who has done slalom on both inlines and quads, I'd be very interested in your personal experience of how your slalom moves translate between the two types of skate, and also what kind of technique changes (if any) you have to adopt. Certain slalom moves are undoubtedly easier on inlines, so I'm curious to know whether people who slalom on both quads and inlines have the same repertoire on each type of skate, or whether they have separate sets of moves depending on which type of skate they're rolling at the time. I only have quad experience, so any slalom-type moves that I do are done within that limited context. I don't have anything else to compare it to, so that's why I'm interested to hear the views of people who skate both. Keep us updated when you're back skating again. There are also some slalom moves that I'm finding really challenging, and it would be interesting to hear whether other other slalom quaddies have difficulties with the same moves, or whether it varies from skater to skater. No, I never bought those quads, so i have no real experience (except my entire childhood). Today was the day I spent my measly budget and bought proper ice skates (the cheap ones I bought did not stand up). I fell in love with a pair of used ice skates (never saw that coming), bought them for 90 bucks and when I got home found them online for $599.99. SCORE!!!!!!! Due to this horrible winter that we just can't seem to loose I've adapted to the ice. This was initially just to supplement skating days when the roller rink was closed, but now is becoming quite an obsession. Do you guys ice skate too? Closest ice rink for me is 50 miles one direction and the sessions are somewhat limited. I also don't have my own ice skates, not since I was about 14, when the local civic arena used to have an ice rink and we had our own semi-pro hockey team. Wish that would come back. Sounds like you got a nice deal. Those ice skates dont have an articulating cuff do they? Most hockey skates don't, thats really the only thing that turns me away from them in general, as to get them tight where I want them often restricts movements elsewhere. I know with heat modling its possible, but lacing them up is always a pain in the arse, even when I was a kid and I had a skate key. Uhh, they appear to be regular skates, but the reason I got them specifically was for the cuff (the cheap skate cuff was soft and too low). They really grip my ankle, but allow for movement exactly like my Seba High Lights. They have some sort of cork-type foam on the tongue and soft heel that doesn't cut your achilles. I love it at the ice rink because I'm doing all the slalom moves and they totally translate. The only hockey skates I've ever tried had REALLY bad ankle support. After ice skating today, went inline skating until it started snowing. Getting my son into it too now (slalom I mean), so it's even more fun setting up cones, and while he works at learning regular tricks like cris-cross, I'm working again on all my left sided moves. Anyway. I'm rambling on, so let me go. Lefty? All nelsons (mega too), crazy, x, sun, and even snake and crisscross, one footed too. Pretty much anything. I've been right-siding it since the 90's. Bad Juju. I'm a little upset. Freestyling all winter was fun, but I'm not sure how much more progress I'll make this year through cones. Any advice on burn out? If you're working on almost all of your weak side moves, then you are obviously diligent and disciplined. I'm therefore surprised to hear you say that you think you won't make much progress this year, and that you feel burned out. I'm probably not the best person to ask about becoming motivated or overcoming burnout, because motivation is something that I've always had during the four years that I've been skating. For me personally, my motivation comes from understanding exactly what I want to get from my skating and then freely focussing on those things. I've sometimes felt that I really "should" be working on certain things in order to make me a more rounded skater; but skating is a leisure activity, so I'm not going to let 'obligation' turn my enjoyment into a chore. I'm not a professional competitor, a career skater, or an instructor, so who cares if I'm weak in certain aspects of a discipline that I never intend to pursue? My reason for skating is fun, not punishment. To maintain my motivation I also avoid being pressured by other skaters (or general expectations and traditions) into doing or not doing certain types of skating. I've had countless people approach (and nag) me to do roller derby, but I can't think of anything on skates that I'd find more tedious, so they always got a very firm "no" from me. I'm more of a quaddie dancer (not Jam, more rhythm skating / JB) but I also have a huge respect for, and interest in, the more aesthetic and complex side of slalom moves. Several other quaddie dancers thought it was weird that I wanted to learn slalom moves when I'm not an inline skater and have no interest in cones. However, they soon changed their tune when I took the slalom moves that I'd learned and started 'dancing them up' in the centre of the rink. Meanwhile, inline skaters were telling me to ditch my quads and learn to slalom "properly" with a view to competing. They completely missed the point. Firstly, I hate competitions and competing, and secondly I would never give up my quads. At first I did find myself giving into pressure to learn foundation slalom moves because that's what you're supposed to do. But I hated it. I'm never going to do cones seriously (I just mess about on them from time-to-time) so why force myself to do something that I find so boring? That's not to say that I can't do any basics, I can snake, criss-cross, basket-weave, one foot etc. all forwards and backwards (both strong-side and weak-side) but they're just easy things that I could automatically do anyway; I didn't actually spend any time learning them. Instead, my time was spent learning more interesting (to me) moves like heel-toe screw, heel-heel screw, fan volte, toe sevens, and cobra etc. The moral of the above is that by understanding what I found to be most exciting and interesting about skating, it helped me to remain constantly motivated because I was never begrudgingly doing things just because I felt a duty to do so (or just because other people kept telling me that I should) so therefore my skating activity has always enjoyable and I never suffer from burnout. Even on days when I'm struggling to make progress with a very difficult trick, I still don't mind, because it's exactly what I chose to be doing. The other thing that helps is that I stop skating completely for 4 to 5 months each winter. This means I get to "miss" skating and don't get a chance to become sick of it (or take it for granted). Where I live there are hardly any decent places (indoors or outdoors) to skate, so winter is a good time to stop because the bad weather makes it mostly impossible to skate anyway. When I start up again in spring, I am always a bit rusty, but it's so exciting to be back on my wheels that I just don't care. We've been lucky this year with a freakishly warm spring. April in the UK is usually somewhat mild (but often rainy) but this year we've had long stints of non-stop sunshine as temperatures of 22 degrees. That really helped me get back into the swing of things, but I guess that's not so easy to do if you're surrounded by snow in up-state NY. If you're looking to get your mojo back then try thinking about what most excited you about skating in the past. Maybe you need to skate more with groups of people (rather than on your own or with just one other person). Perhaps try to get down to Central Park more often, or spend some time teaching basic slalom moves to interested beginners. Seeing other people progress through the basics can often fire up your own desire to also make your own progress and move up to the next level. Yeah, thanks, I sort of needed to hear that. The reason I'm upset is that I've been completely obsessed with inline skating for the past 25 years. Seriously. It's always been my baby. Around the same time that I started looking into quads went ice skating and decided to go with that (long winter). I didn't know that ice skating would dominate my soul. It's like having two children. My slalom mojo's gone! AGHHH! I'll take some of that advice anyway, and let you know how it works. So now it's my birthday and I'm getting those quads!!! spent my first 15 years on quads, so really excited! Am I going to completely loose my mind trying to find time for all three? Oh yeah, one last question. I have noticed many people in the UK using those hard cover quad skates. What kind of skates are those?